Megan Sullivan went on the trip of a lifetime with a brand new boyfriend. camera (Megan Sullivan/megthelegend.com) Megan Sullivan traveled to the 7 Wonders of the World in 13 days. Megan Sullivan got hit by a car, fell 50-feet off a cliff, was diagnosed with skin cancer, met her future boyfriend and went on a trip with him to see the Seven Wonders of the World in 13 days, all in the span of about two months. 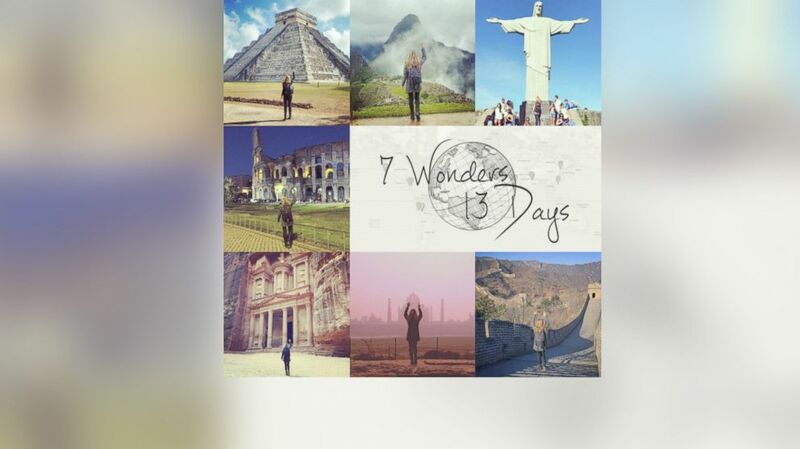 Sullivan, 31, says she had been dreaming of a trip to see the Seven Wonders of the World for nearly three years but never knew when it was going to happen. Last November, the San Francisco-based producer had the trifecta of catastrophes -- the car accident, cliff fall and cancer diagnosis -- happen all that month. Around the same time, Sullivan met her now-boyfriend, Chris McNamara, 36, who asked her on their second date what the one thing was she had always wanted to do in her life. "I let him know about the journey and he said, ‘Yeah, let’s do it,’” Sullivan told ABC News. "I was like, ‘What are you talking about.'" When Sullivan, whose skin cancer was treated with minor surgery, got 13 days off work, the couple decided to drop everything and see the Seven Wonders of the World in 13 days. (Megan Sullivan/megthelegend.com) Megan Sullivan and Chris McNamara in Brazil on their trip to see the Seven Wonders of the World in 13 days. Sullivan and McNamara left for their dream trip in late December, after just about 10 days of planning. Their trip is now going viral thanks to a Facebook post from Ashton Kutcher, after Sullivan posted a video of the trip, which she also documented on Instagram and a blog. In all, the couple traveled 28,211 miles across 12 countries, taking 15 flights. Sullivan’s favorite stop was Beijing and the Great Wall of China. Sullivan had to utilize her producer skills of thinking on the spot and managing logistics when a gate agent at the airport in India told them they did not have the right Visa to travel to China. The couple almost did not even get to that part of their trip after they overlooked the time difference at their first stop, Chichen Itza in Mexico. Once they landed in Cancun, they realized they had just about six hours to drive to the first wonder, visit it and take photos and return for their flight to Peru to visit Machu Picchu. Sullivan and McNamara not only made it to Peru and the rest of the Wonders, their relationship survived too. They even returned overseas over Memorial Day, this time for a quick trip through Europe, where they saw the sights on electric skateboards.